Just one thing: As citizens of heaven, live your life worthy of the gospel of Christ. Then, whether I come and see you or am absent, I will hear about you that you are standing firm in one spirit, in one accord, contending together for the faith of the gospel. Paul called the Philippians to contend “together for the faith of the gospel.” Other Bible translations use the verb “strive.” This verse is one place when the words strive and gospel should be kept together. We never strive in our own moral goodness to earn our salvation. “By grace through faith” is the gospel message. But we always strive for the faith of the gospel. To strive is to compete for a win. We strive for the faith of the gospel when we live so the gospel will win. Let the gospel win in your heart. Trust completely and only in the work of Jesus for you on the cross. Don’t trust in yourself. He is the only one who can forgive you and make you clean, and he will. Consider yourself spiritually alive because your Savior Jesus is alive in you. Remind yourself every day and every moment that you belong to Christ. Let this good news be a power in your heart that produces all kinds of goodness. Let love flow from you because the love of Christ has been set on you. Let the gospel win in the Christian community. See the good news of Jesus as the main news of your church. Christians need the good news too, so share it with each other in your church. Relate to one another in a way that promotes love, joy, peace, patience, kindness, goodness, faithfulness, gentleness, and self-control. Pray that people who walk into your church service will be given good news. Let the gospel win in your community. The gospel wins because God causes it to do so. God uses Christians and churches that are being changed by his grace to give testimony to his power and love. Some people from the community will respond to this testimony with faith. The gospel will win in their lives. 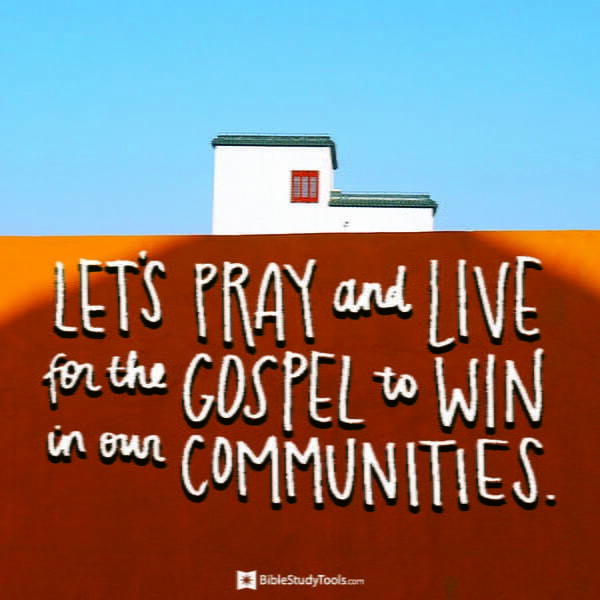 Let’s pray and live for the gospel to win in our communities. Excerpted with permission from Words of Grace: A 100 Day Devotional by Scott Patty. Copyright 2018, B&H Publishing Group. You can get a copy here. Scott Patty is the founding pastor of Grace Community Church of Nashville, Tennessee. He was raised in Nashville and came to faith in Christ as a high school student. He is a graduate of Belmont University and Midwestern Baptist Theological Seminary. As a pastor, Scott's primary calling is to serve the congregation by casting a biblical vision for all of life through the preaching of God's Word. Scott and his wife Beth have two married daughters.